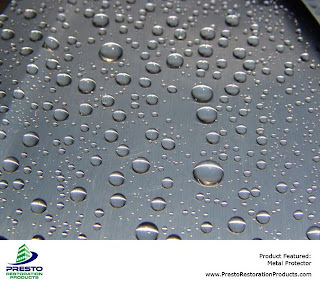 The Metal Protector® Series: Protective coatings for metal and anodized aluminum surfaces that resists stains caused by mineral deposits and other environmental contaminants. These products contain high-performance silicone and acrylic coatings designed to install durable, long-lasting protection to a variety of metal surfaces, including anodized aluminum, which is commonly found on window mullions. These products shield metal surfaces from water and oxygen, and help prevent these elements from aiding in corrosion of the metal; thus preventing the need for frequent restoration. A barrier is created between contamination found in the environment and the metal surface, forcing stain-forming contaminants to settle on the polymeric coating. These contaminates are then easily cleaned during regular window cleaning maintenance services. These coatings will last at least five years depending on individual environmental conditions, and the frequency of maintenance services performed on the substrate. Metal Protector HD: leaves a high gloss finish on the surface enhancing the appearance of the metal, in addition to installing a protective barrier. Prior to application of the Metal Protector Series products, use Metal ReSurfacer® and ensure proper surface preparation.